We are a recommended name in manufacturing Lee Decor Curtains which deliver durable service. Being extremely presentable in looks, These are made from durable tear and puncture resistant PVC material in order to keep out moisture and debris. All the customized orders are taken for manufacturing PVC curtains in varied sizes for doors of different lengths. We offer these curtains in common sizes. More sizes can make customized sizes too. We are offering Plain PVC Shower Curtains. Also you can choose between plain shower curtains and printed shower curtains or can design both mix. These curtains are available in sizes like 137cm x213cm and can easily fit shower rail. 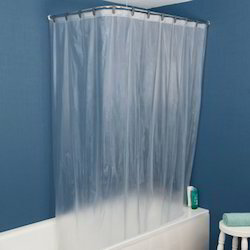 Manufactured from 100% PVC base material, our curtain is fully water proof and can be hung with 12/ 16 reinforced eyelets.